Tuesday 14th June at 7.45pm HADAS ANNUAL GENERAL MEETING at Stephens House and Gardens. Please make every effort to attend the AGM of your Society. The Society needs more volunteers to give help as the Society does not run itself. If you are unable to attend please spend a little time sending your apologies either by email to the Chairman or Secretary or a phone call. All details are printed at the back of the Newsletter. Also come along to support your President Harvey Sheldon who will deliver a presentation after the AGM on the Rose Theatre, ‘The Rose Discovered and the Rose Revealed’ – this being the 400th anniversary of Shakespeare’s death. The May lecture was attended by over 50 people, it would be good to have a similar number for the AGM. All the above events, unless otherwise stated, will be held at Stephens House & Gardens (formerly Avenue House), 17 East End Road, Finchley N3 3QE, starting at 8pm, with tea/coffee and biscuits afterwards. Non-members are welcome (£1.00). Buses 82, 125, 143, 326 and 460 pass nearby. Finchley Central Station (Northern Line) is a short walk away. Stephens House & Gardens (Avenue House) is hosting two outdoor events in June & July. Free admission. HADAS will have a table on both dates. 12th June 12-5pm: A celebration to mark Her Majesty the Queen's 90th birthday. Live music, maypole dancing, stalls inside & outside. Food and drink will be on sale or bring your own picnic. 17th July 12-5pm: Annual Summer Fête. Live music, fun & games, stalls, food & drink. AOC & The Friends of Eastcote House and Gardens are excavating at Eastcote House and Gardens (High Road, Eastcote Middlesex HA5 2FE) again this year on the last week in June, 2016 and first week in July, 2016. If any HADAS members would like to volunteer to dig, apply in the first instance to AOC on 020 8843 7380 or email London@aocarchaeology.com It would also be an interesting site to visit during the two weeks dig. It is rare that an opportunity occurs for excavation of the Lundenwic waterfront since it is located under the buildings lining Victoria Embankment Gardens. However, the refurbishment of the Adelphi building necessitated the installation of a new lift and its associated shaft. This was to allow further access to the underground car park shared with the neighbouring Savoy Hotel. In order to accommodate the lift mechanism, the surface of the lowest level of the car park had to be removed and the shaft extended down. This allowed for excavation of an area approximately 4m x 5m. Apparently it was very quiet down there, although the proximity of various luxury cars lent the site the ambience of a “Bond” movie set! Any ideas of luxurious conditions for the excavators were dispelled by the slides showing bags and bags of spoil that had to be brought to the surface by hand for reuse later. The moment the car park surface and associated rubble was removed from the excavation area a compacted layer was exposed, possibly an outside surface. Below this, there was Middle Saxon material, including loom weights close to the top. A later, 8th century, ditch and pit had been cut into the layer. Pottery from this area was dated as post AD770 and indicated habitation rather than waterfront, with an oyster shell midden of significant proportions, as well as many other items such as antler, horn and bone combs. Bone pins or thread pickers and a bone needle point to cloth production or netting. Soil samples yielded 10,000 pieces of animal bone. Micro layers of ash, burnt wood and burnt clay were possibly from timbers burnt in situ. The associated pottery indicated this happened around AD770. Below this level, 250 kilos of reused Roman building material pointed to a systematic movement of material up-river from the City, and this location on the waterfront as a possible landing place. There was also evidence of brushwood possibly having been used to consolidate a wet and muddy surface. Deeper in the excavation Saxon waterfront timbers were exposed. These did not extend into the river but were for managing and supporting the waterfront and were dated as being earlier than the building destroyed in c. AD770. The vertical limit of the excavation was 1m 80cm and at this level postholes and evidence of wattle indicated the earliest waterfront post c.AD650. Each successive line of waterfront timbers had dumps of waste material used for bank consolidation associated with it. Notable finds included part of a barrelhead, identified by Damian Goodburn as being European in origin, possibly from the head of the Rhine Valley. Is this evidence of the re-establishment of a wine trade? In addition there were leather objects including shoes, and a tiny fragment of cut glass, not Saxon, possibly Levantine. Very little metal was found apart from a few rolled fishing weights. And one possibly silver coin - a Thrimsa. Of the 5 published as being from London only one is from an archaeological context. This is closely datable to AD655 – 675 and is a “Two Emperors” type. This was an interesting lecture and an object lesson in the value of excavating even a limited area of a significant site. The project has involved tunnels cut some 30-40m below the surface through chalk and clay deposits with a few fossils such as sharks’ teeth in the London clay, plus a rare piece of amber, tested for any undisturbed prehistoric air sealed within, but none was found. By glacial epoch times some 68,000 years ago there are finds from a tundra environment from west of Paddington from the course of the River Westbourne, including reindeer and bison bones which had been chewed by wolves. Mesolithic flints have also been found. Bronze Age finds from Plumstead include timber stakes with tooling marks, possibly parts of trackways across wetlands. At Farringdon, traces were found of some of the 40,000 people who died in London in nine months during the Black Death of 1348-49. The plague burials at Charterhouse Square were hinted at by earlier skeletal finds; burials were of individuals in ordered, but layered, rows, not the popular conception of bodies tipped haphazard into plague pits; teeth were sampled to prove the presence of the Black Death. At the Bedlam burial ground, opened in 1569 and closed in the early eighteenth century, known burials looked for, but not found, included two Levellers, one executed, and another, John Lilburne, the author of “Freeborn Rights”, buried there in 1657. There was a trial dig on part of the Bedlam burial ground at Liverpool St in 2011, this being the first municipal burial ground to cover overflow from parish burial grounds; it closed in 1739; large numbers of burials disturbed during redevelopment in the nineteenth century were re-interred at Ilford cemetery, and 400 more were excavated in 1985 as part of the Broadgate redevelopment. Some 30% of the cemetery is believed to remain some 1.5m below street level, with a 2m depth of burials – some 3,000 bodies, with Georgian buildings over the upper burials. Some charnel pits are known, and some half-dozen not-in-situ grave slabs were found, one for a woman from the height of the great plague in 1665. Seventeenth-century burials have more evidence of coffins than just plain shrouded burials; there is some evidence of violence including blunt force trauma from fights; one burial bore a heavily corroded and undecipherable chest plate. One mass burial was found of 40 coffins interred in one day with the burials highly compressed. Question posed – was the Great Plague bubonic or influenza? The 3,500 bodies excavated from the Bedlam site will be recorded and then reburied, with a small group being retained for further study by the osteology team. The Roman finds from the Walbrook have gained considerable publicity. This area, lined by Ermine St, seems to have been little used other than for burials. A heavily trafficked and rutted road surface was found with even horseshoes lying in the ruts; the roadside ditches contained pottery, coins and numerous skulls, with whole lines of skulls in the ditch fill which in Roman times was a typical pond environment; perhaps they were associated with the nearby fort at the NW corner of Londinium, as a gruesome/warning display lining a possible military road leading to the fort and used in its construction, with the skulls eventually tumbling into the ditch after display? We may never know. Many others had previously been found in the channel of the Walbrook, possibly washed down from local cemeteries, 40 more in the Walbrook dig; a comparable find might be the line of skulls in a ditch outside the Roman fortress at Colchester. Excavations at Clitterhouse Farm, Cricklewood by HADAS. NGR: TQ 23689 86819, SMR: 081929, Site investigated July/August 2015. For background on this project please see HADAS Newsletters 539 (Feb 2016) and 542 (May 2016). This is an attempt to show a basic ‘phasing’ of the Clitterhouse Farm moated site through maps, documents and some archaeology with similarities to that of Finchley Manor House, it’s a rough guide and not meant to be pinpoint accurate. Although we have pulled together some of the documentary references, it’s not a definitive history record. “Numerous nucleated settlements (villages/hamlets) are known to have existed or originated during this period illustrating the density of settlement in areas for which previously there is little archaeological evidence. For the most part, these settlements developed away from Watling Street, although Hyde and Cricklewood are exceptions and are recorded on 1281 and 1294 respectively. The nearest other villages/settlements at this period are Hendon to the north (with a parish church) Oxgate to the west (the nearest to Clitterhouse), Finchley (with a parish church) to the northeast and West End to the south.” (Desk-based assessment, Archaeology and Cultural Heritage, on behalf of Brent Cross Cricklewood Development Partners). This report refers to the Brent Cross Development south of the North Circular Road and includes Clitterhouse Farm and Playing Fields. Finchley Manor, a Scheduled Ancient Monument, in East End Road is a similar moated site to Clitterhouse Farm, at Finchley Manor (TQ 2552 9003, SMR 081886) there has been some limited excavation here by HADAS and DGLA. It is not precisely known when the house was established “we do know that the Manor of Finchesle was mentioned in a charter granted by King John to the Bishop of London – William de Sainte Marie Eglise – dated 16 June 1199”. “The present house, built in 1723, is not the original mansion which, records tell us in 1504 stood ‘within the moat’.”(Finchley Manor: influential families by Fred Davies, Barnet Libraries Publications). There are references elsewhere to a possible original house c1253. HADAS, led by Paddy Musgrove in 1982, undertook a small excavation in the cellar of the existing 1723 Finchley Manor House to possibly locate any evidence for the earlier medieval structure below the later one. Lifting flagstones off the floor - “The rubble consisted of broken bricks, hand-made roofing tiles and a considerable amount of plaster, much of which had been painted. It also contained animal bones, shells, fragments of wood and charcoal, together with pottery and other artifacts which can be dated to the 17th century or later, thus confirming that the flagstones examined definitely did NOT represent the floor of an earlier manor house cellar.” (Clues to Finchley’s Past, HADAS NL 133 1982, P Musgrove). The inference being that the medieval dwelling is nearby within the moated area. D. Bowsher, LA Round-up 1991) concludes “Part of E-W moat some 10m (33ft) wide and 2.50m (8ft) deep was located. Pottery from backfill was in the main 17thC, with residual 15thC pottery”. 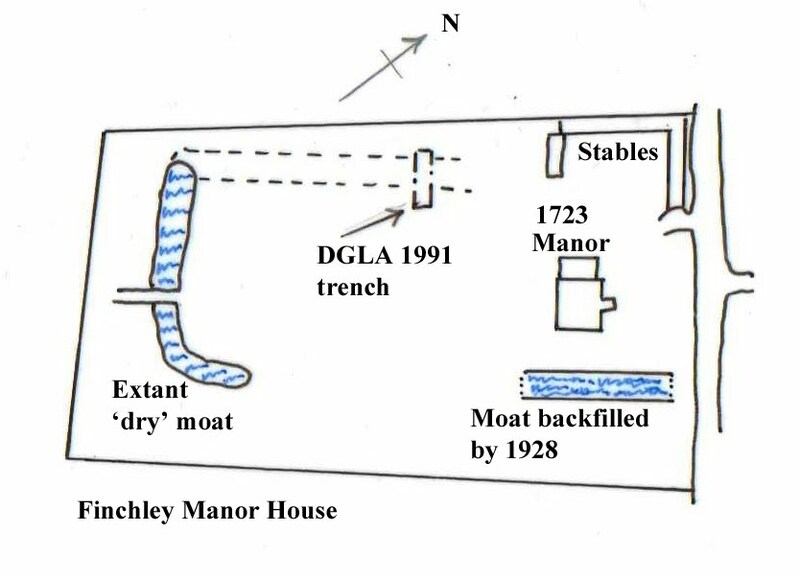 There have other surveys of Finchley Manor moat by HADAS, in 1970 B.R. Martin measured five sections across the moat, and in 1989 Jean Snelling with the DGLA conducted a Watching Brief with further surveying. These produced widths of the moat between 18.00m to 23.00m. There was a water feature to the north of East End Road, an ornamental-garden and ‘fishponds’ possibly 17th/18th century, these are not usually considered to be associated with the earlier medieval moat and are not mentioned further here. “The main purpose of digging a moat in the late Middle Ages was to enhance the status of the house and to provide some protection but it was also useful for draining low lying sites on clay subsoils. However moats also provide many practical benefits such as a convenient water supply, a source of fish for Fridays and fastdays, a quick means of dousing fires and a sewage outlet” (Information panel at Finchley Manor by Roy Walker 1991). The site is not open to the public. “The nucleus of the manor of CLITTERHOUSE was a house and one carucate (a medieval parcel of farmland) held by John de Langton in 1321 (fn. 146) and by his younger son Robert in 1335. (fn. 147) Robert's son and namesake held it in 1361, when it was called the manor of Hendon, and successfully defended his tenure against Ralph de Langton, his uncle. (fn. 148)” (Victoria County History, London, 1976). This is the first mention of Clitterhouse Farm from documentary sources that we know of, and it would have been established well before that looking at the foundations of other nearby farms and manors. One of the first map references we have is a 1584 survey held by St Barts Hospital Archive (SBHB/HC/45/1). This map shows the farm surrounded by woodland and orchard (see also part 2), a pond is sited to the west, adjacent to the farm access track, then there is a ‘U’ shaped moat, the ‘open’ end faces south-west. Within the moat there are two buildings orientated south-east to north-west, whether these are the literal orientation or just a representation is difficult to say. But the structures are shown with pitched roofs, have two stories (possibly jettied?) with windows and doors, the doors look big and may represent barns and stables with living accommodation above (?). The access track leads to a gate beside the first building, this building lays across the ‘open’ end of the moat, the other lies about halfway into the moated area (see figure 2). The northern corner of the moat is curved while the eastern corner is a sharp right-angle. As a very rough guide the area enclosed may encompass 150ft x 150ft (45m x 45m), the width of the moat may be 20ft. The next map is from 1715 (SBHB/HC/45/2) this includes a fine panoramic view of the then farm buildings surrounding the farmyard. By this time the complex has expanded with the addition and infilling of further barns and stables, “The farm-house was shown in 1715 (fn. 167) as a large timber-framed building of two storeys, with three gables and a jettied first storey. It occupied one side of a courtyard, on the other sides of which were weatherboarded barns of the standard Middlesex type, with steeply pitched roofs, and stables” (Victoria County History, London, 1976). Whether this complex incorporates the earlier buildings is not known, the 1584 map does not show any gables so the likelihood is they have been completely rebuilt. To facilitate this expansion, part of the north-western arm of the moat has been backfilled and built over to accommodate a ‘wheat-barn’ and stables (see figure 2). But the farmyard complex is still essentially within the moated boundary, a “Gateway” leads out to the western access track/road. Moving on, we have a plan held by St Barts Hospital Archive (SBHB/HC/45/19) done between 1790s to approx. 1816, this shows a proposal to rebuild the site. A plan similar to the earlier 1715 layout is over-written in bold with the new proposed development including repair or new build of barns, stables, cowhouse, cartshed and granaries, some of this was carried-out and other ideas dropped. The only structure left within the moated area was the ‘wheat-barn’ (above) with added bays and a (rebuilt?) granary, plans for a new curving ox-shed and a new barn within the moat were abandoned. Also “pulled down” in this area was the “Old House” (to be replaced by a “new house”, west of the site) and adjacent stables. The upshot was that the centre of the farm moves slightly westwards – to the other side of the range spanning the open end of the moat. The 1584, 1715 and 1816 phases of Clitterhouse Farm, the A--A line is approximately the ‘central’ line through the different periods. The illustrations are simplified and not to scale. A map of 1816 (SBHB/HC/45/34) reflects the new arrangement (see figure 2) within the moat, is the wheat-barn and rebuilt barn ‘spanning the open end of the moat’ with the gateway leading west into the ‘new’ farmyard. A new southern arm incorporating new stables, the northern incorporates the carthouse and pigstye and a fish-pond, the pond is seen on the 1584 map and is a constant through most of the farms history. Further west is the newly built (c1790s) farmhouse, a square structure with two western bays, it’s not known if this was in brick or timber. The new farmhouse is built on a slightly different alignment to the rest of the complex, this could be that it fronts on to an east-west trackway leading off the north-south (approx.) Clitterhouse Lane entrance road from Watling Street, also it aligns with the access road to the farmyard running behind the new farmhouse. In the immediate area east and west of the farm are formal looking paths and gardens. In the 1860s period much of the farmland west of the farm had been sold off to the Midland Railway, access from Watling Street was ‘stopped’, maps of the time show datum points and surveying for the laying-out of the future north-south running Claremont Road which passes directly in front of the farm. The farm itself hasn’t changed much from the 1816 map, although the ‘wheat-barn’ has been extended westwards into the moated area, there may be a compound next to it perhaps for an animal enclosure (see figure 3). As for the moat, the shape survives, but has been formalised/landscaped with ornamental ‘bit and bobs’. At some point in the latter half of the 19th century the farmhouse is rebuilt on the same footprint, “From Clitterhouse Farm a former C19 farmhouse remains in Claremont Road, three bays with a little polychrome brickwork” (Pevsner, London 4: North 1998). Also in the late 19th to early 20th century some of the main farm building is rebuilt in brick into a dairy farm, with cow sheds added to the northern side of the farmyard. Around 1900 maps indicate the ‘wheat-barn’ and its extension in the moated area have been demolished and at a similar time the moat is filled-in and ploughed over, the same fate affected the long-lived farm pond. In 1925 the farm was sold, the surrounding land used for playing fields, civilian airfield by the Handley Page Company, housing estates and other development. 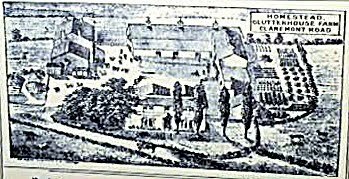 The dairy farm complex with a few alterations and different uses still stands today. The moated area - the early heart of the site, lies under the car-park probably still surrounded by its infilled and buried moat. The HADAS excavation has shown that evidence for the moat still survives, but was it bigger and surround a larger area in the medieval period? Work at Finchley Manor has shown this could be the case. Small amounts of medieval pottery hint at possible pre 1321 occupation of the Clitterhouse site. Other areas that could be investigated include current east-range of the farm, this approximately corresponds to the range of the earlier buildings that spanned the open end of the moat. This area has been occupied since at least 1584 (and probably before) and is in the position of the 1715 ‘Great Old Barn’. Future development of the area immediately adjacent to the farm complex - car-park, playing field and new road access are to be upgraded and it is hoped that these areas will be archaeologically investigated by HADAS or other professional archaeological bodies. Luisa Valejo, Alistair Lambert & The Clitterhouse Farm Project. Roger Chapman – documentary research. St Bartholomew’s Hospital Archive (various maps and documentary sources). Desk-Based Assessment (2008) of the Archaeology and Cultural Heritage on behalf of the Brent Cross Cricklewood Development Partners. Finchley Manor: influential families by Fred Davies, Barnet Libraries Publications. Museum of London, DGLA 1991, Bibsworth Manor. The Manor House Moated Site, East End Road, Finchley by Jean Snelling (HADAS). After centuries of neglect, a grotto built in 1720 under a road in Twickenham by the illustrious Alexander Pope is finally revealing its hidden treasures. I was fortunate to be able to visit it last September. Born in London, Pope (1688–1744) was a poet, classical scholar, essayist, collector and traveller. He suffered numerous health problems, including tuberculosis, but despite this he travelled widely and found time to translate Homer's Iliad from the Ancient Greek. Earnings from this magnum opus enabled Pope in 1719 to buy some land in Twickenham, and for 25 years his villa, grotto and garden acted like a magnet for major literary figures of his day, many of whom, like Voltaire and Jonathan Swift, arrived by boat along the River Thames to disembark at Pope's riverside estate. A road divided Pope's villa from its garden, so a tunnel was built to join the two. This gave Pope, ever the classicist, the opportunity to create a grotto for himself and his guests recalling the classical imagery of Homer's grotto of the Naiads and Calypso's bower in the Odyssey. Work began in 1720, after Pope had returned from a visit to grottoes in Italy, with more and more items added to his collection each year until there were more than two hundred geological and historical features built into the roof and walls; these included minerals, fossils and crystals, shells and flints, a stalagmite from Wookey Hole and even basalt from the Giant's Causeway in Ireland. Many items were gifts from his eminent visitors. At the riverside entrance to the grotto are two small side rooms, probably once part of the villa's cellars. At the other end are steps to bring the visitor back to ground level. The grotto is about 25 metres long and dimly lit, so a torch is useful to pick out the various treasures all around. After Pope's death his garden and grotto continued to attract visitors and his gardener, John Serle, published a guide to their layout and content. But in 1807 Pope's villa was torn down by an occupant who was fed up with the persistent visitors. This led to a romantic painting by J.M.W. Turner, who also lived in Twickenham: Pope's Villa during its Dilapidation. Now a group of concerned academics and enthusiasts has launched a plan to rescue the grotto, one of the first in England and the inspiration for dozens to follow. Many buildings have come and gone on the site over the years but the grotto under Cross Deep has remained largely forgotten although it is now Grade II* listed and on the Heritage at Risk register. The current owner of the property, Radnor House School, is in the vanguard of restoration, working with Pope's Grotto Preservation Trust to raise funds. They aim to improve the lighting, secure the flooring and create a digital resource for worldwide admirers of Pope's life and work. It is hoped that in the future, with the school's permission, Pope's Grotto will be open to visitors on special occasions, and that a representative of the Trust will be able to come and talk to us at one of our monthly meetings. N.B. We welcome further interesting reports of visits / news items for your newsletter. Ed. Sat 11 June UCL Institute of Archaeology will be holding free, fun family events for the CBA’s Festival of Archaeology. To include behind the scenes tours, art activities and artefact handling for all ages. Sat 18 June, 11am - Friary Park. Unveiling of a plaque in front of the ‘Peace statue’ by the Mayor of Barnet. Plaque will provide details of the history of the park, the story of the statue and the sculptor. Sun 19 June, 12-6.00 pm - East Finchley Festival, Cherry Tree Wood (opposite Station, off High Rd, N2) Many stalls (inc. Finchley Soc. & Barnet Borough Council), entertainment, food & drink. Sat 2 – Sun 3 July, 12-7.00 pm – East Barnet Festival, Oak Hill Park, Church Hill Rd, East Barnet, EN4 8JS. Community stalls, incl. Barnet Borough Arts Council, music and dance. Theatre in the Park on Sunday at 3pm. Food, bar etc. Tues 12 – Sun 17 July – Dig at Elsyng Palace, Forty Hall, Forty Hill, Enfield, EN2 9HA – open to the public on Sunday 17 July. Contact Martin Dearne see above.